Finding a good book to read can sometimes be challenging. If the book in question is a new author or series, sometimes the reader is unwilling to take a chance. Book clubs are one good way to try out new books. There are actually several different local book clubs. The branches of the Fort Worth Public Library system run several. The Weatherford Public Library has a book club. There is even a new group for moms meeting in Aledo. Another way to find out about new books is word-of-mouth. One author, whose popularity is increasing due to word-of-mouth advertising, is Maria V. Snyder. Her new book, Outside In, just hit the shelves. 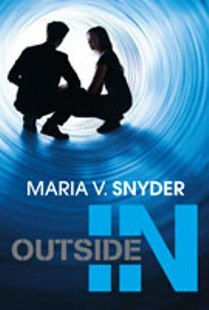 Outside In is the sequel to the YA book Inside Out, a departure from Ms. Snyder’s Poison and Glass books. Outside In is a well-written, fast-paced story that continues a tale of rebellion and trust set against an unusual and very vivid setting. Trella succeeded in leading the rebellion to free the people of Inside from the dominion of the Travas, but she didn’t realize just how much her life would change. Instead of returning to her old life as Queen of the Pipes, now she’s forced to suffer through Committee meetings and politics, and never has a moment alone. But when the scrubs start rebelling against the uppers, she realizes something has to be done before Inside falls apart. As it turns out, the people of Inside are the least of her problems. Outsiders have taken over the computer systems and now control Inside, and they intend to get rid of all the Insiders. Trella’s not sure whom she can trust, but she’s determined to save Inside again, or die trying. With her many enemies, she won’t have to try too hard.